If you are a procrastinator, you’re in good company. Some of the greatest minds in the world — including Leonardo da Vinci — were famous procrastinators. 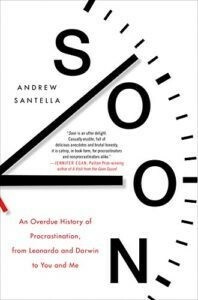 Journalist Andrew Santella explores the upside of putting things off in his new book, Soon: An Overdue History of Procrastination, from Leonardo and Darwin to You and Me. It’s a funny and insightful look at how we’ve become so good at getting distracted — and why it’s not always such a bad thing, unless you want to be more productive. Knowledge@Wharton: Why did you procrastinate in writing this book? Andrew Santella: When I embarked on the project, I was really hoping that if I dove deep enough into the history and the psychology behind procrastination, I might find some kernel of justification, an excuse for my lifelong habit. Basically, my agenda was all self-interest. But what I found is that some really accomplished people have tended to be procrastinators. It’s interesting to find that even great thinkers could become a little more understandable to us, a little more accessible to us, even to regular schmoes like me, because we all share that pretty human tendency to put off the things that we dread doing. Knowledge@Wharton: Do some people simply believe that taking the extra time may give them a deeper level of thought or understanding to a problem? Santella: That’s right, and it gets really dizzying the more you think about it, or at least it did to me. One of the characteristics of procrastinators is that we’re always trying to fool ourselves and deceive ourselves about what it is we’re doing. When I’m lying on the couch staring at the ceiling absentmindedly, I’m telling myself and sometimes telling my wife that I’m really writing. I’m really thinking about this problem. Maybe that’s true, maybe it’s not. Am I deceiving myself, or is there something to that? When it comes to creative thinking and problem-solving, there’s no one efficient path to follow. Sometimes the ideas will come to you when you least expect it, and sometimes ideas will come to you when you’re doing anything to avoid them. Knowledge@Wharton: What was it about Leonardo da Vinci that made him such a procrastinator? Santella: Da Vinci is one of my favorite characters because, as a longtime freelancer, I could really relate to him. He was asked to complete a project for a church in Milan, and I loved his response. He said, “Yeah, I’ll have it for you in six months,” which is typically optimistic. That’s the sort of optimism that any freelancer can relate to. It took him 25 years to deliver the piece. It’s funny because we think of him now as a great thinker, a polymath and an ultimate Renaissance man. But to his contemporaries, he was a little bit of a joke. He was the guy who never finished what he started. The lesson of his story is that there are a lot of ways to get things done, there are a lot of paths to accomplishment. Part of the reason Leonardo didn’t finish things was because his mind was so active. He was drawn in so many directions by his insatiable intellectual curiosity. His notebooks and his sketch books are amazing. He was always taking on these huge tasks. Sometimes, we’ll get things done when we’re doing anything but what we’re supposed to be doing. And sometimes what seems like the detours Leonardo took end up being important paths. Knowledge@Wharton: What about Charles Darwin? Santella: Darwin engaged in a decades-long delay. He came up with the ideas at the root of natural selection more than 20 years before he got around to finally publishing On the Origin of Species. He must have known that his ideas were world-changing and crucially important, yet he delayed in pursuing them. He did other things. He edited a gardening magazine. He got really interested in earthworms. He got obsessed with barnacles. He spent years and years researching barnacles. One of the stories is that he had so many barnacles pickled in jars around his house that his kids grew up thinking that this was what everyone did. Darwin had these obsessions that he was pursuing when he might have been pursuing natural selection. Again, he’s following a path that seems to lead him away from the important stuff. As in Leonardo’s case, it’s hard to say what’s important and what’s a detour. You can make a case that the things Darwin learned in the course of his earthworm research ended up informing his big idea about natural selection. Knowledge@Wharton: In those two examples, you have identified procrastination as either deeper thought in trying to reach a goal or as a diversion. In writing this book, did you find one is more prevalent with procrastinators than the other? Santella: One of the things I learned was that, when we procrastinate, we very rarely just do nothing instead of the thing we’re supposed to be doing. There’s always a replacement activity. If I’m not deceiving myself, sometimes that replacement activity that we’re not supposed to be doing ends up being more worthy, more wonderful than the thing we were supposed to be doing in the first place. That’s one of the comforting things about being a procrastinator, if it’s not a self-deception. I guess you have to listen to your procrastination and try to understand it. Knowledge@Wharton: I didn’t realize this, but there is a patron saint for procrastinators. Can you tell us about that? Santella: I was raised Catholic and thought I knew every saint that there was to know, but I had never heard of St. Expedite until I started working on this book. I should say that it’s pretty well-agreed now by everyone who cares that he never really existed. He’s sort of a legendary figure and a paragon of promptness, which is funny because it’s only a fictional character. Only a legend could be as prompt as Expedite was. The rest of us actual human beings tend to delay and dither a lot. Knowledge@Wharton: You say procrastination and failure are linked. When we fail to do something because we procrastinate, that allows us to rationalize the failure, correct? Santella: Yeah, sometimes. Self-handicapping is the term that psychologists use to talk about this. For example, if I have an exam coming up on Saturday that I’m a little afraid of, I might sabotage myself by staying out late on Friday, not studying, partying. Why would someone do that? If I fail the test, I’m protecting myself. It’s not because I’m stupid, it’s not because I couldn’t pass the test, it’s because I didn’t try my best. We’d rather think of ourselves as unprepared rather than just incapable, if that makes any sense. That’s one of the things about procrastination, though. It often doesn’t make sense. There’s a twisted logic to it, a perverse logic to it. And it makes it harder to figure out when we’re deceiving ourselves and when we’re being honest with ourselves. Psychologists who study this stuff have a more rigorous definition of procrastination than most of us do. When most of us talk about procrastination, we use the word to mean any kind of delay. But a psychologist would insist that procrastination is delay undertaken with the knowledge that, at some point, it is going to come back to bite you in the future. There has to be knowledge that what you’re doing is harmful to yourself in some way or will be in the future. That’s one of the distinctions that I learned to make about procrastination. Knowledge@Wharton: What some would see as procrastination, others would see as normal because of our busy lives. Would you agree? Santella: It seems like there are so many more ways to divert ourselves, divert our attention. There are unending streams of information coming at us. “I’ll get around to starting this writing project, but let me check my Twitter account first.” The next thing you know, it’s 6 p.m. and you still haven’t started. Not that I’m speaking from personal experience! It might seem easy to blame information technology for our tendency to procrastinate, but one of the history lessons of procrastination is that people have been finding ways to put off what they don’t want to do for as long as there have been things to do. It long predates the internet. It long predates my Twitter account. Knowledge@Wharton: What did you learn about yourself by doing this book? Santella: I’m ashamed to say that I’m not as awful a procrastinator as I thought I was. People would ask me, “What are you working on?” And I’d say, “I’m writing a book about procrastination.” Almost invariably, they would say, “Oh, that’s the book for me. I’m the world’s worst procrastinator. I’m a terrible procrastinator.” They were using all these very judgmental, negative words about themselves, yet they were sort of bragging about it. There is a typical ambivalence about their procrastination. They were at once ashamed of it, but perversely proud of it, too. I totally feel that way about my own procrastination. That’s why I say I’m a little disappointed to find out that I’m not the world’s worst procrastinator. I suppose the finished product of the book is testimony to that. Knowledge@Wharton: By giving examples of well-known people who are procrastinators, you give us a sense of commonality. Maybe it’s not as bad as a lot of people think. Santella: That’s what’s great about reading about history’s great procrastinators, and that’s what I loved about researching the book. Their stories are good cover for the rest of us procrastinators. I could look at Leonardo and say, “It worked for them. Maybe I’m not so bad.” I suppose that’s a dangerous game to play because I’m not Leonardo and I’m not sure I can get away with what they got away with. But knowing their stories helps us understand ourselves as procrastinators and why we do what we do. Or, more relevantly, why we don’t do what we don’t do. Knowledge@Wharton: How is procrastination linked to to-do lists? Santella: I am a devoted list-maker, and it really doesn’t help me get my tasks done. The reason I make so many lists is that it makes me feel like I’m doing something, and I like having a long list of things to do. It makes me feel like I lead a more interesting life. The thing that’s great about having so many lists around is that you can always come back to old list, and quite often they’re still good. Most of the things on there, I still haven’t gotten around to doing. One of the things I learned to do is make lists that are a little easier to complete. If I get up first thing in the morning and brush my teeth, the first thing I’ll put down on my to-do list is “brush my teeth.” I can cross it off right away, and it’s an amazing feeling of accomplishment. Knowledge@Wharton: Can procrastination be a tool in our arsenal of things that we use to be a better person at work or in society in general? Santella: I’m not sure I would recommend it as a productivity tool. I would take issue with the premise of productivity tools and productivity in general. I think procrastination is something that we should tolerate and try to understand better. If we try to use it as a way to get things done, then we’re just falling prey to the same sort of devotion to efficiency that doesn’t work for us in the first place. I think we should listen to the procrastination, try to understand what it’s trying to tell us about ourselves, try to reflect honestly about what we’re putting off and why we’re putting it off. That might help us understand what really matters to us and how we can get things done better and more quickly. Knowledge@Wharton: What is the message you hope readers will take away from this book? Santella: I hope that they’ll be more tolerant of procrastination in others and in themselves. We’re all human. We’re all wrestling with the same demons. So, that’s the first thing: a plea for tolerance for the world’s procrastinators. And I would ask them to embrace and understand the history of procrastination. 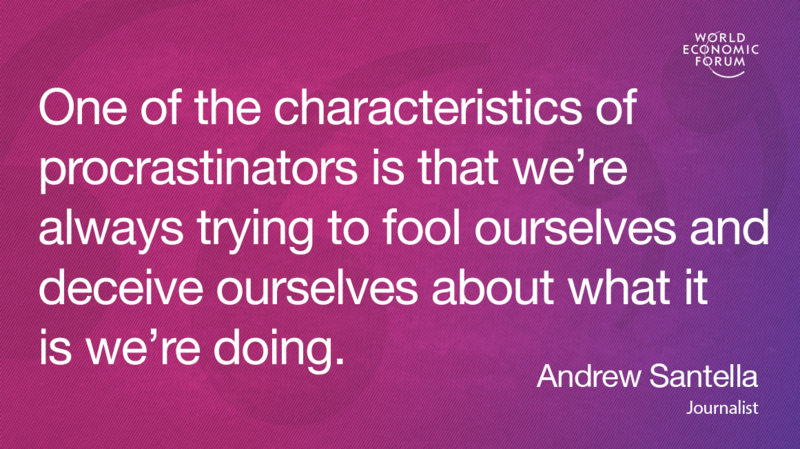 There’s a lot to be learned by studying the great procrastinators. Frankly, if you don’t learn anything, it’s a great way to kill some time.